Junk and Rubbish Removal Services in Connecticut. At 1844-Junk-Rat – junk and rubbish removal in Connecticut is made easy… because we do all of the work! Connecticut based junk removal services offered by 1844-Junk-Rat.com are affordable, reliable and tailored to fit the individual needs of both our residential and commercial clients. If you need piles of junk removed from your basement, back yard, garage, home, or office we are here to help. Our professional junk haulers are happy to do all of the heavy lifting so you don’t have to. In many cases we can come out the same day for urgent junk removal, or you can set up a time in advance for your clean-up project. In an effort to keep in touch with the community, we donate items that are in usable condition to local charities and recycle other debris that qualify. The rest are properly disposed of in a way that leaves the least amount of carbon impression per captia. 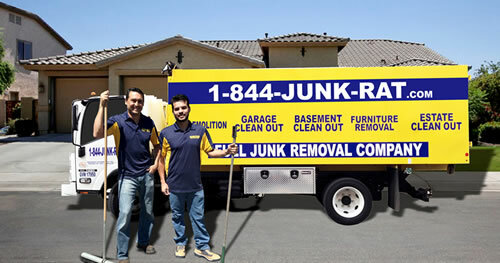 If you are ready to get back the space in your property that claimed by unneeded junk, call 1844-Junk-Rat.com now! Most people sell their old appliances when they buy new ones, but mine were totally non- functional. I looked in the local paper for a company that handles eco friendly Appliance Removal and saw a big advertisement for 1-844-JUNK-RAT.com. Since I wanted to get the stuff out pretty fast I gave them a call. I was greeted by sweet lady on the phone who answered all of my questions patiently. She went on to explain that they are the pride of the Hartford area and had the best rates on appliance removal along with the fastest lead times. I set the pick up for the next day and the crew arrived on time in a professional looking truck. In less than an hour my place was clear of old appliances and they were happy to sweep the area free of charge afterwards. If you are on a budget but still want the best service around, 1-844-JUNK-RAT.com is the perfect solution for every time.